Batman - Animated Series (Kenner)Love this figure. i'm still a kid and i finally got him a couple weeks ago after years. His appearance is terrific and so is his jacket. His umbrella whirls around like a top. 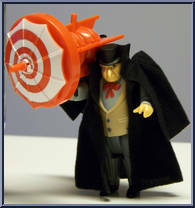 I give this figure 4.5 stars because the umbrella had the potential to be a lot better. It doesn't even look like and umbrella. He goes for some pretty high prices but it is definitely worth it and will provide plenty of fun.